In considering the demand for, say, widgets, there are many things to consider. And, we know that one of the key factors in the demand for widgets would be changes in prices of markets for goods economists call substitutes or complements. Economic theory predicts that if the price of a substitute for widgets increases (decreases), the demand for widgets will increase (decrease). And, of course, any changes in a complementary product’s price will have the opposite effect on the demand for widgets. 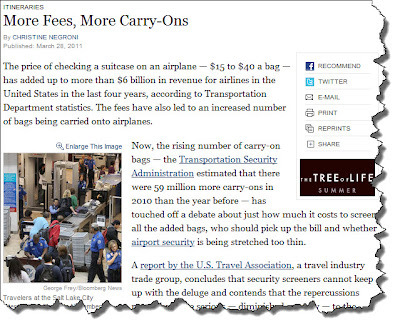 The following story is from the March 29, 2011 business section of the New York Times. Most travelers need to carry clothing and supplies to their destination, and there are substitute methods to accomplish this transport. You can check your bag or you can take extra carry-on bags. 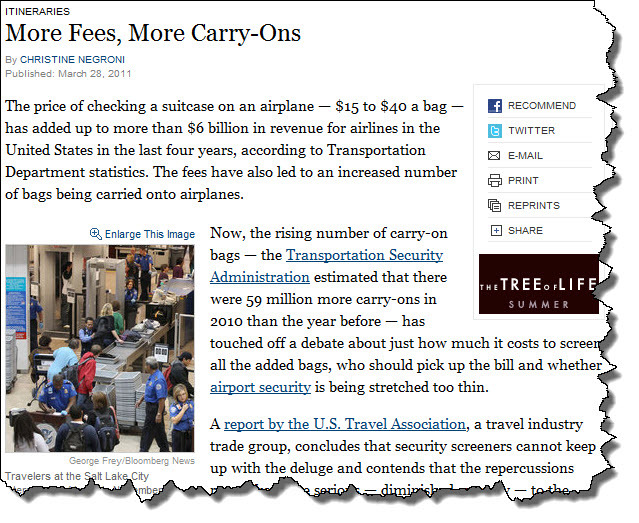 This story shows dramatically how the increase in the price of checking your bag has lead to a large increase in demand for a substitute to checking your bag: carry-ons. And, if you were to read the story you would find examples of the negative externality effect of congestion. Each person who increases his or her carry-ons is adding to an overall social cost of congestion, both at the TSA lines and in the nerve wracking boarding process where people try to fit bags seemingly twice their body size into the overhead compartments.